Usually glass, but not always. Other materials include semi-precious, ceramic, wooden, acrylic. Varies (I now have some seed beads available, but they are in plain colors). Usually 1mm, but sometimes larger. Most of the mystery beads that I send out will have less than 5% defects. If I send out mystery beads that have more defects than that, I will include extra so that you get at least $3 worth of beads. 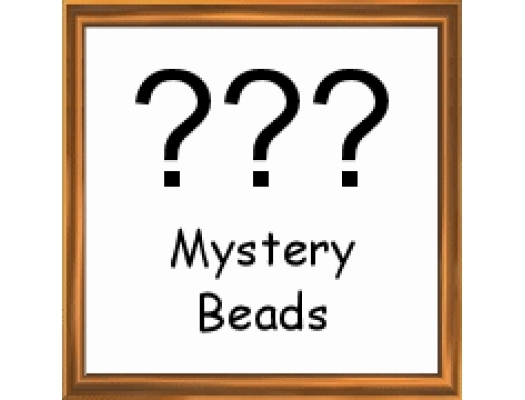 What are mystery beads? Mystery beads are a surprise. If you order, say, one lot of mystery beads, I will select $3 worth of beads for you. They could be any type of beads: small or large, smooth or faceted, plain or fancy, normal quality or premium (no defective beads). You could get anywhere from 100 small beads to 5 premium beads; it all depends on their value. If you order two lots, you could receive two different styles of beads, or one large lot of one style -- or you could get one pendant or cabochon. The beads you get may or may not have been posted on my site at one time, but they aren't posted on my site now (if they were, you could just order them). Note: In August, 2012 I started to go through my beads left over from the 1980's (when I made jewelry myself), and many of those older beads will be sold off as mystery beads. My beads from the 1980's include ceramic and semi-precious beads. I also have left-over metal findings from the 1980's which I am selling as mystery beads. In September, 2015 I started to buy Chinese samples from eBay, and those will end up as Mystery beads. Why mystery beads? I have a lot of odd-lot beads sitting around. Most of them are too small in number to photograph, but too many in number to throw into my Odd Lot jar. For example, I usually buy beads by the mass (1200 beads), but sometimes the supplier is running out and will send me whatever number is left: 300, 400, etc. It isn't worth my while to photograph such small amounts of beads and post them on the site, and such beads will be sent out as mystery beads. Also, sometimes people return beads which have gone out of stock. 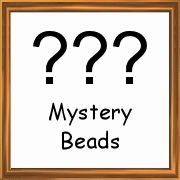 Instead of reposting them on the site, I will sell them as mystery beads. Why should you buy mystery beads? You could do it for the fun of it (if you like surprises), or you could do it as a challenge. If, for example, you get beads you wouldn't ordinarily buy, you could take it as a challenge to find some way to use them. Doing that could stimulate your creativity. Of course, you can always return them, but where's the challenge in that? I don't refund shipping charges for returned mystery beads. If you are very particular about the beads you like, you are not a good candidate for mystery beads. But if you are adventurous, or if you buy bead mixes, or if you make eclectic jewelry, you are a good candidate.